What game would be better suited for a LEGO collaboration than Minecraft? Announced at LEGO World Copenhagen, Minecraft Micro World is now available for pre-order for $34.99. You can watch the very technical way in which they were made in the video from Mojang above. 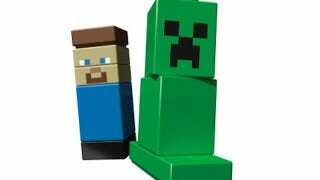 Included in the set is Steve and a Creeper, as well as all the expected Minecraft tools: You'll have access to wood, dirt and stone in addition to the Minecraft modules.